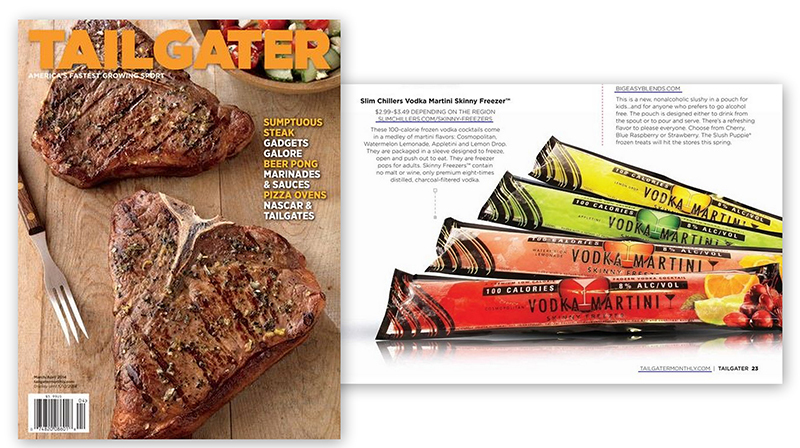 Congratulations to our Client Slim Chillers for their feature in Tailgater Monthly! As the warm weather moves, in we all begin to daydream of sunset BBQ’s,Â 4th of JulyÂ getaways andÂ lazy days at the beach or pool, but oh-oh…that fantasy is soon spoiled by the next inevitable realization… IT’S BATHING SUIT SEASON! !Â All thoughts of relaxation are replaced by diet and calorie counting. How can you enjoy all the great upcoming events with their inevitable focus on food and drinks while still maintaining that sleek physique? The answer – this summer’s most exciting and delicious product- Skinny Freezers! These are the FIRST ever frozen Vodka Martinis. They are fun to eat and have only 100 calories each, so no counting necessary!!! Whatâ€™s your pleasure? Appletini, that great Granny Smith apple flavour with a kick? Lemon Dropâ€™s wonderfully refreshing lemon perfection, Watermelon Lemonade with its tasty balance of sweetness and tartness, or Cosmopolitan, a blend of cranberry, orange and a pinch of lime. Four wonderful flavours blended with top quality, eight-times distilled, charcoal-filtered vodka. Check them out at SlimChillers.com!